Having already confessed to being a reader of middlebrow fiction, I get occasional emails from readers asking for recommendations. Well, there’s no disputing matters of taste, so don”t blame me if yours isn”t mine, and this particular recommendation may be too Brit-oriented for American readers, but my most recent middlebrow binge reading has been Hilary Mantel’s two novels about Thomas Cromwell,Wolf Hall and Bring up the Bodies. World-shaking masterpieces? Nah, but they kept my attention for a thousand pages. There’s a third book gestating, the author tells us, to finish off Cromwell’s life. There’s also a TV series from the first two, currently being shown on PBS. Cromwell (1485?-1540) was Secretary to King Henry VIII of England. He was the king’s fixer, his chief factotum, the guy who got things done. Cromwell got some quite tremendous things done: the annulment against Papal opposition of Henry’s first marriage, the separation of the English Church from Rome, the dissolution of the monasteries, and the framing (probably) and execution of Henry’s second wife, Ann Boleyn. Ban jun ru ban hu goes the old Chinese saying: “To attend a prince is to attend a tiger.” Cromwell’s religious radicalism was too much for the king at last, and he lost his head. Henry’s Christianity was conservative. He would happily have stayed with Rome if his first wife had given him a son (and would not likely have believed the charges against Ann if she had). However, he was only the second king of his dynasty; loyalists and claimants from the previous dynasty were watching and maneuvering; Henry believed”probably correctly”that without a clear male successor, the horrible civil wars of the previous century would restart. The story of Henry, his wives and his schism, has been much told, but not previously through Cromwell’s eyes. Cromwell has a walk-on part in Shakespeare’s 1613 play Henry VIII, positively portrayed: “A man in much esteem with th” king, and truly a worthy friend.” His reputation went downhill from there, though. By the mid-20th century he was the amoral bully persecuting the saintly”and eventually sainted”Thomas More in Robert Bolt’s brilliant play and movie A Man for All Seasons. 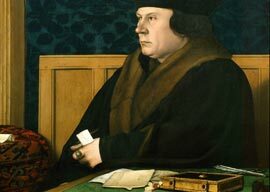 That is probably the definitive portrayal of Thomas Cromwell for most people today who know the man’s name at all. I do nobody harme, I say none harme, I thynke none harme, but wysh euerye bodye good. And if thys be not ynough to kepe a man alyue, in good faith I long not to lyue. This was said on April 30th, 1535 O.S.”480 years ago next Friday”when Cromwell and four others interviewed More at the Tower, where he was held prisoner. We have those fine strong words from More’s own pen: he wrote his daughter a letter describing the interview. Cromwell, by More’s account, made no direct response. He seems to have been chastened by More’s sincerity; he only repeated some mild queries about the Act of Supremacy, then concluded the interview.